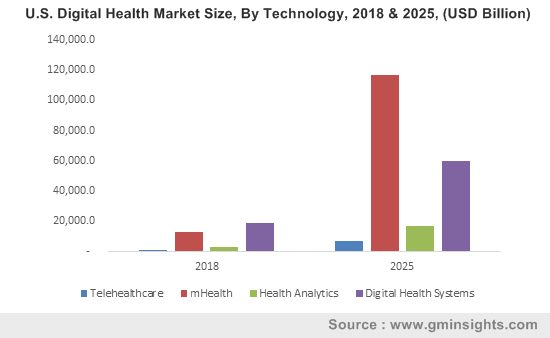 Digital Health Market size was valued at USD 86.4 billion in 2018 and is expected to witness approximately 29.6% CAGR from 2019 to 2025. Rapid technological advancements in healthcare IT such as cloud-based storage system and increasing adoption of smartphones and tablets by healthcare professionals to track and monitor patient health and history is major factor driving the market growth. Rising developments in healthcare IT along with favourable government regulations has largely encouraged the adoption of various healthcare IT solutions such as electronic medical records, e-prescribing systems, remote patient monitoring, and wearable medical devices. Such factors will boost global market growth. Rising venture capital funding including private equity and corporate venture capital in the health IT sector will escalate the market growth over the forecast timeframe. However, rising security concerns for patient data such as cyber security threats including uncoordinated individual attempts to gain unauthorized access to information technology (IT) systems is expected to hinder digital health market growth over the coming years. High capital cost requirement for installations of technologically advanced systems will further hamper digital health industry growth. Digital health systems technology business is estimated to reach USD 156.9 billion USD by 2025 due to increased adoption of advanced technology such as and Electronic Health Record (EHR) and Radiology Information System (RIS) in hospitals that reduces timeline for medical documentation and aids in investing efforts for diagnostic procedures. Supportive government initiatives along with rapidly improving IT infrastructure are some of the factors that positively impact industry growth. mHealth business segment is expected to grow at a robust 38.8% CAGR across the forecast timeframe. High growth is attributable to rising adoption of technological advancements including wearables and apps to monitor health of patients. Wearables such as pulse oximeters, blood glucose monitors, sleep apnea monitors have wide range applications including disease tracking, treatment and diagnosis, point of care diagnostic, remote data collection & remote monitoring. For instance, AliveCor Heart Monitor is a mobile-based electrocardiogram that enables individuals to gain clear insights on their cardiac health using these precise recordings. U.S. market accounted for largest share in 2018 owing to increasing prevalence of chronic diseases along with growing geriatric population in the country. Implementation of HITECH Act and HIPAA Act, promoting the use of electronic health data will foster market growth in the country. High technological adoption along with favourable government initiatives such as investment in electronic medical records (EMR) are other factors boosting business growth. Germany market is anticipated to witness rapid growth of 29.8% CAGR over the coming years. Rising demand for innovative technologies and systems for the effective management of chronic ailments such as diabetes, orthopaedics, cancer and others will fuel digital health business growth. Favourable government initiatives such as implementation of e-Health law that aims at creation of electronic health card and setting up infrastructure for telemedicine will propel business growth in the country. Japan digital health market is expected to reach USD 27.4 billion by 2025. Rapid adoption of telehealth and mobile health technology along with growing joint ventures for digital health solution in the country are factors further propelling business growth. 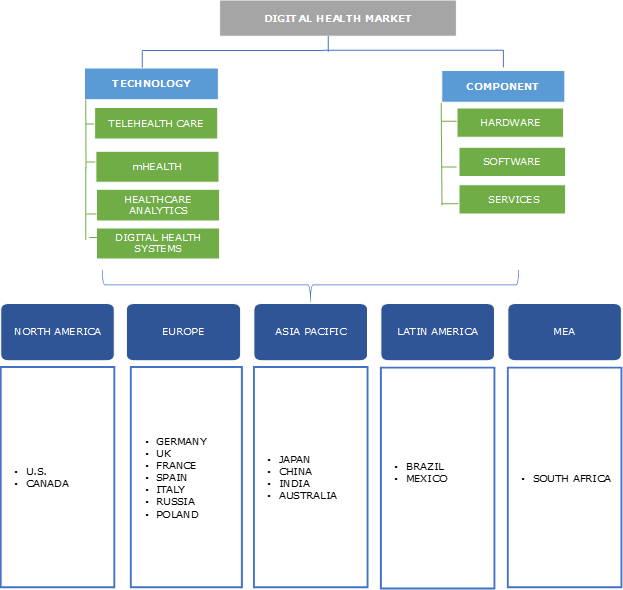 Some of the major market players operating in global digital health market are Allscripts Healthcare Solutions Inc., McKesson Corporation, eClinicalWorks LLC, Cisco Systems, Inc., Qualcomm, Philips Healthcare. Major firms are concentrating on collaborations, agreements and joint ventures for market expansion and to increase market reach. For instance, in January 2018, Allscripts Healthcare Solutions announced about its plan to acquire Practice Fusion. This strategy will assist the company to expand its presence and customer-base across U.S.
Digitization in healthcare sector along with supportive government initiatives for improving healthcare infrastructure will boost digital health industry growth. 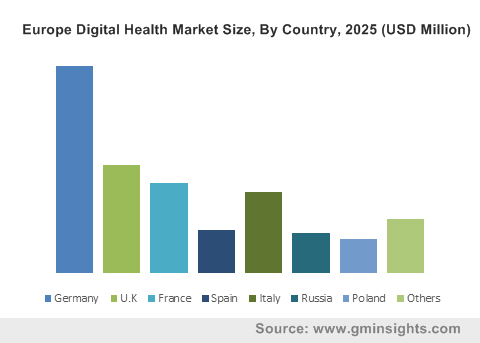 Developed nations such as U.S., Germany, and Japan are mature markets in the digital health industry growing at rapid pace during the forecast timeframe. Well-established healthcare infrastructure along with high adoption of medical apps among patients and doctors to improve collaboration and monitor health status will augment digital health industry growth in the developed countries. On the other hand, the new digital health model will play a pivotal role in overcoming many of the challenges impeding healthcare delivery in the emerging countries such as India, China, Brazil, South Africa. The new model will improve healthcare access, affordability, quality and safety thereby boosting digital health industry growth.